thirty-two departments. Its population is estimated 47 million. A regional department of Colombia located in the North of the country. Its capital is Cartagena de Indias, the fifth biggest city in Colombia. By 2013 the population was estimated in 2 million people. The small village in Bolivar has a history of about 200 years. Although located in not easily accessible terrain, many farmers settled in the area because of its fertile lands and fresh water resources. Before the massacre in 2000 the prospering El Salado with about 7000 inhabitants was due to be upgraded to municipality status. The city with a population of 100,000, generally referenced to as El Carmen, is strategically well located along two main highways. The distance between El Salado and El Carmen de Bolívar is approximately 19,6 Km. After both massacres many people from El Salado settled in El Carmen. The armed conflict in Colombia began in the 1960’s with the creation of the FARC (revolutionary armed forces of Colombia) - a guerrilla claiming to fight for the rights of the poor and social justice in Colombia. Since then, the conflict has grown into a civil war between the Colombian government, paramilitary groups, crime syndicates and left-wing guerrillas such as FARC, and ELN (National Liberation Army), all seeking to increase their influence on Colombian territory. According to Colombia’s National Centre for Historical Memory, 220.000 people have died in the conflict between 1958 and 2013, and more than 5 million civilians have been displaced or suffered other types of violence. Colombia has the highest number of internally displaced people in the world with 5.7 million since 1985. According to the Internal Displacement Monitoring Centre (IDMC), military confrontations between armed groups and the security forces, as well as threats to individuals and communities cause the majority of displacements. 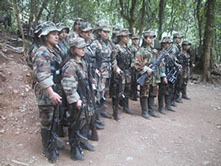 The United Self-Defense Forces of Colombia (AUC) was a right-wing illegal military group formed in 1997 by drug-traffickers and landowners to combat kidnappings and extortion by guerrilla forces. Paramilitary violence reached its peak between 1999 and 2001 committing a few hundred massacres resulting in hundreds of fatal victims and thousands of displaced. The AUC were also known for assassinating rural leaders and are suspected to have been contracted by multinational companies to silence worker union leaders. In 2003 the Colombian government signed a peace deal with the AUC –named the Justice and Peace Process– under which paramilitary leaders would receive reduced jail terms and protection from extradition in exchange for surrender of arms. The Revolutionary Armed Forces of Colombia (FARC), created in 1964, is the oldest and largest illegal military group among Colombia’s left-wing rebels. It finances itself mostly with drug trade which began in the 90’s. FARC is on the EU and US lists of terrorist organizations. Peace talks with the Colombian government began in November 2012 in Cuba, focusing on key issues like land reform, political participation, disarmament of the rebels, drug trafficking, the rights of victims, and the post-war scenario. Known as the paramilitary successor groups, they emerged in Buenaventura (pacific coast of Colombia) after the failed demobilization of right-wing paramilitary organizations in 2003. These groups combine control of cocaine with extreme violence, child soldiers and extortion of businesses. 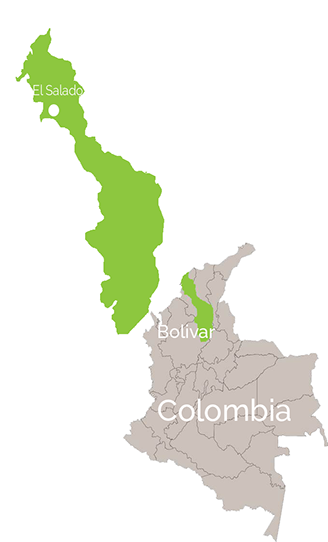 Bacrims, or Neo-paramilitaries are said to run many of Colombia's illegal gold and coltan mines. Recent reports found an increasing number of assassinations of human rights activists. Academics argue that Bacrim groups are in fact the same as their paramilitary predecessors but have been re-branded by government to show a success of the paramilitary demobilisation. On February 19th of 2000 Neida Narvaez ran. She ran like she never did before. Behind her back was her village, filled with torture and death. But inside of Neidas' womb was her unborn child. Her first daughter. The paramilitaries had surrounded and entered El Salado from all sides. In front of Neida were the emerald green covered hills, the Montes de Maria. "I felt helpless, an experience of not being able to do anything to save my friends and family..."